Martha Senay always told herself she’d learn to golf when she had more time – and just started taking lessons in Briar Hill, the adult lifestyle community she’s called home for eight years. But as the season warms up, she’s easily lured away from the links by the lakes and rivers that abound in Central Ontario. She and husband Greg, who has yet to retire as chief of Vaughan Fire and Rescue Service, spend most of their leisure time on the 36-foot Carver cruiser they dock at nearby Lefroy Harbour, an inlet off Cook’s Bay on Lake Simcoe’s southern shores. On summer weekends and holidays, the boating couple escapes into the wonders of the Trent-Severn Waterway system. They’re sometimes accompanied by grown children and young grandkids, but always by J.R., their one-and-a-half year old Shih Tzu, who rules the deck in the safe comfort of his doggie lifejacket. 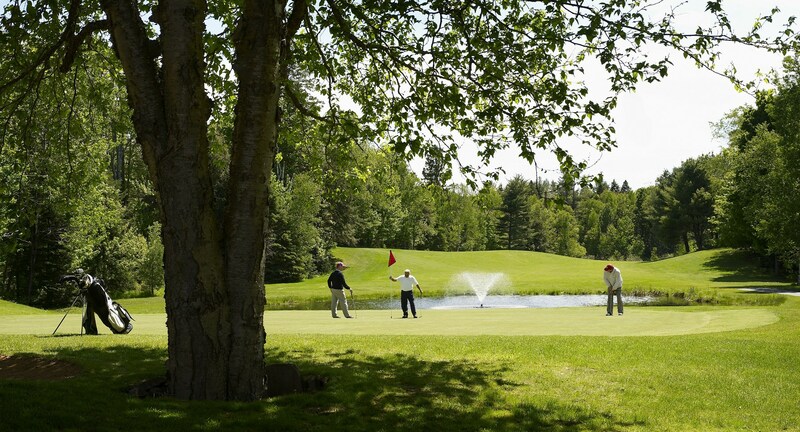 “Golf attracts a lot of people to Briar Hill,” says Martha, referring to the 45 holes available to play on site. “But for us it was about the adult lifestyle – it’s very quiet here, the low maintenance, and location.” Having just returned from a month in south-west Florida, she spoke of the ease with which they can lock up and leave without a worry. “We were looking to downsize, but wanted to stay around the south part of Lake Simcoe,” she recalls. The condostructure and maintenance services mean the neighbourhood always looks attractive, but they don’t have to do the lawn work. “We had a half-acre before – it was allencompassing.” So, when their youngest of three was about to fly the nest, it was time to downsize. Briar Hill fit the bill. Located on the eastern outskirts of Alliston and a 45-minute drive north of Toronto, it has a large community centre, and access to the amenities of the adjacent Nottawasaga Inn Resort, which boasts a 70,000-square-foot Sports and Leisure Dome with swimming, skating, fitness and court facilities.